Mayanaguri, February 8: Prime Minister Narendra Modi during his visit to West Bengal laid foundation for the four lane of the Falakata-Salsalabari section of National Highway-31 D in Jalpaiguri. Gifting the deprived from having the basic necessity of good infrastructure PM Modi slammed Mamata Banerjee for ignoring the people of the state and said it disrespects the soil of land and has made the people desperate. Hitting out at Mamata Banerjee and her TMC government, PM Modi said that the state government has done nothing constructive for the people so far. The demands of the people are not fulfilled. The people of Jalpaiguri will get justice in Jalpaiguri itself. They won’t have to go to Kolkata to get to the High Court. 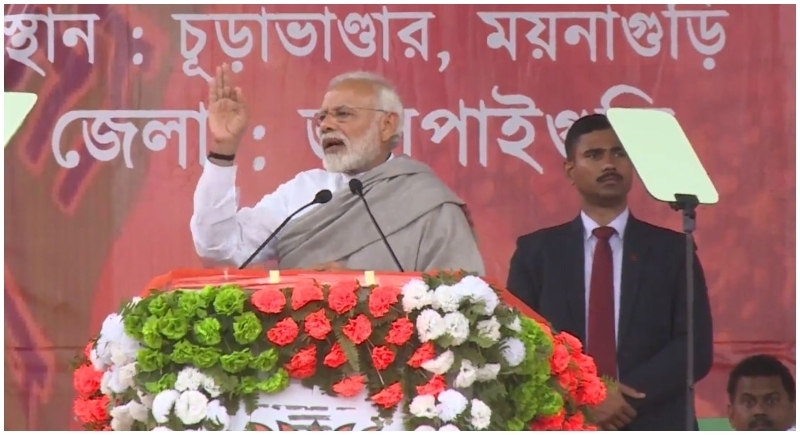 Describing the relation with Jalpaiguri as a ‘tea-relation’, PM Modi said that the people of the state grow tea, and he will make the tea by giving them employment and development. Over a long period of time, the people of West Bengal have been facing atrocities due to the tyranny rule of Mamata Banerjee. The law and order situation in North Bengal has worsened over the years. Industries were not developed, youth are migrating, and projects of schemes are stalled, but all this doesn’t bother the West Bengal government. The facilities these people are getting are being done from Delhi by the Central government. North Bengal is known for three Ts - tea, timber and tourism. All three were neglected by all the previous state governments. The government never paid attention to the sustained development of this region. PM Modi taking a jibe at Mamata Banerjee said that she is is keen to go to Delhi, but has left the people of Bengal suffocated with syndicates. Giving example of Tripura, PM Modi said that like BJP uprooted the red flag in Tripura, whatever happened there will happen in West Bengal too. Taking a jibe at the Mahagathbandhan, PM Modi said that his government won’t spare the scamsters. He said that the Mahamilawat is a group of all those who have no vision. Didi’s government welcomes infiltrators but stops BJP leaders. Attempts to stop BJP leaders are a signs that Trinamool is frustrated. When Prime Minister Narendra Modi recreated the flashlight moment in West Bengal, the people went crazy showing immense support. Signifying support to Bharatiya Janata Party with the trust and belief that the state will see a new beginning of progress and prosperity, the people attending the rally reciprocated with flashing on their mobile flashlights.